Ahmadiyya Youngsters who have come all the way from UK, France and Germany to study Medicines In Bulgaria were lined up for a very great cause to donate their blood for the people of Bulgaria. 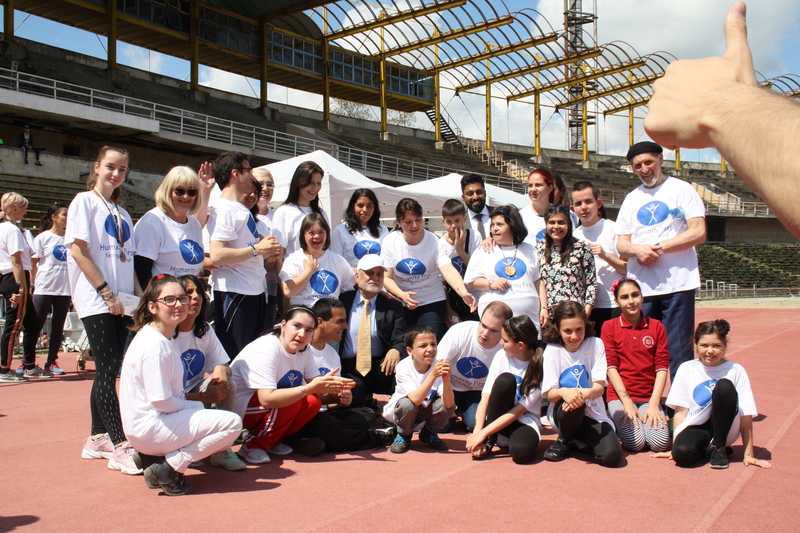 None absented from this noble cause knowing the fact next day all have to organise and participate in charity walk and foot ball match organised by Humanity First in collaboration with Municipality of Plovdiv, the second largest city in Bulgaria. 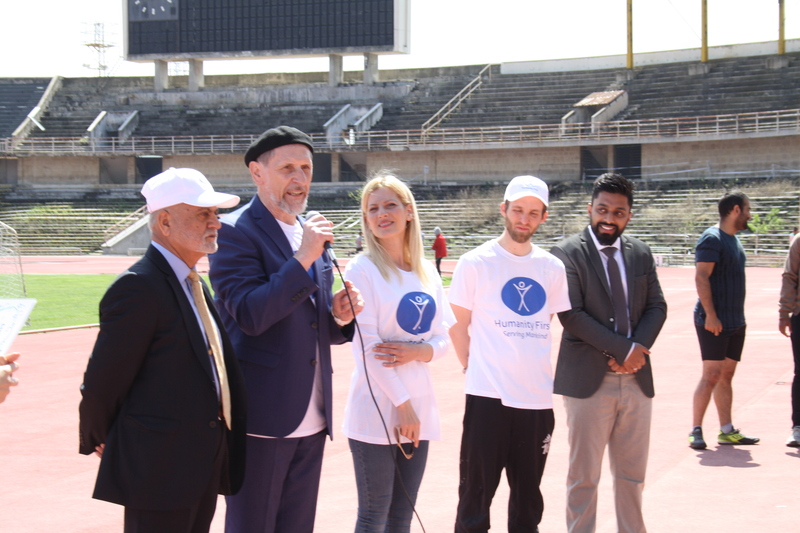 Mr Abdullah Wagishauser along with other Office Bearers inauurating the HF Event in Stadium. It was a great festive ceremony in the main Plovdiv Stadium. Mr Jawwad–Uddin Affan curently stationed in Bulgaria established the contact with Social Welfare Department of Municipality of Plovidv and offered to donate the Medical equipment required by the School taking care of children with special needs. Director Social Welfare of the Municipality, Ms Vaselina Boteva along with Head of School Ms Bateba, Mayor and Deputy Mayor appreciated the humanitarian gesture and welcomed whole heartily the idea. Mr Palmen Sotirov, Sales Manager of firm Adapt.Bg was kind enough to visit the school and to prepare the required items which included tram lifter and few chairs fitting to the needs of school. Mr Palmen Sotirov, Sales manager Adapt.bg shwoing the donated Equipment. Day of April 13 was agreed to have festive ceremony for handing over the donated equipment. Along with donation, additional activities were also planned which included 2 charity Runs of 800 meter and 200 meters respectively by adults Male and Female as well children. 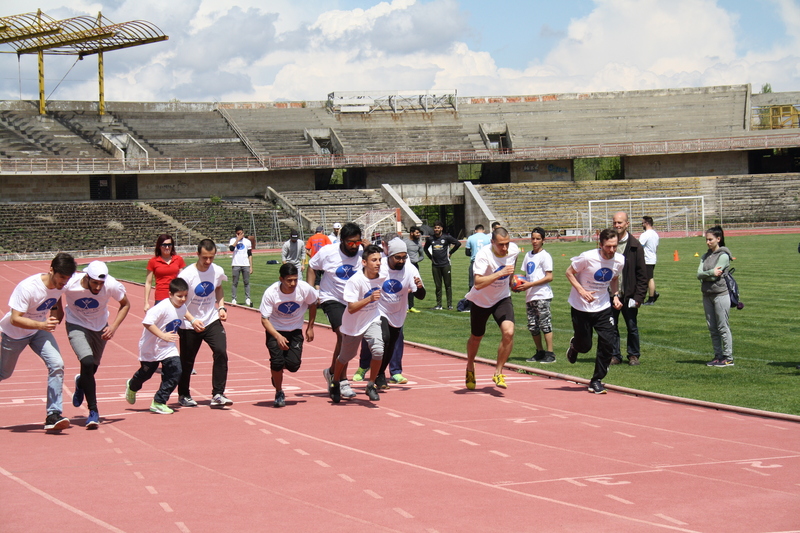 An exhibition football match also scheduled between students and professors. Ms Boteva the Director of Social Welfare Department of Plovdiv Municipality remained the true spirit behind the success of this humanitarian event. Ms Boteva, the main Spirit behind the event gets HF Shield. Weather department of Bulgaria forecast indicated heavy rain on 13 of April which created worries for the success of the event. An urgent fax humbly requesting the special prayers was sent to Spiritual Head of International Ahmadiyya Muslim Community. Whole night 12 and 13 April witnessed heavy rains. However early morning prior to start of Humanity First event Allah Almighty showed His mercy and Kindness. Clouds disappeared and during the whole program Sun kept on shining. 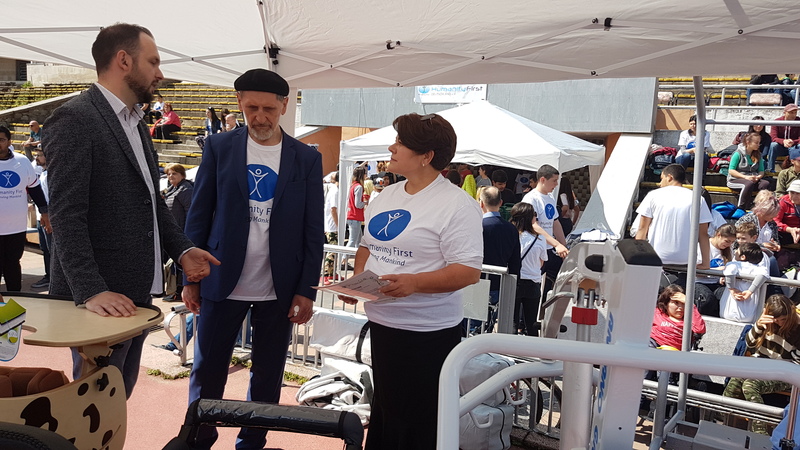 National Head of Ahmadiyyaa Community Germany Mr Abdullah Wagishauser, Director Marketing Humanity First Germany Mr Stefan Haerter, Director Projects for South East Europe Mr Zubair Khan travelled from Germany to be part of this festive event. Brother of Mr Jawwad Mr Zia extended full cooperation. Almost 35 Medical Students currently undergoing studies were the most visible group to donate blood and to facilitate organisation of this event under the leadership of Mr Haseeb recently appointed to lead these Ahmadiyya youths. 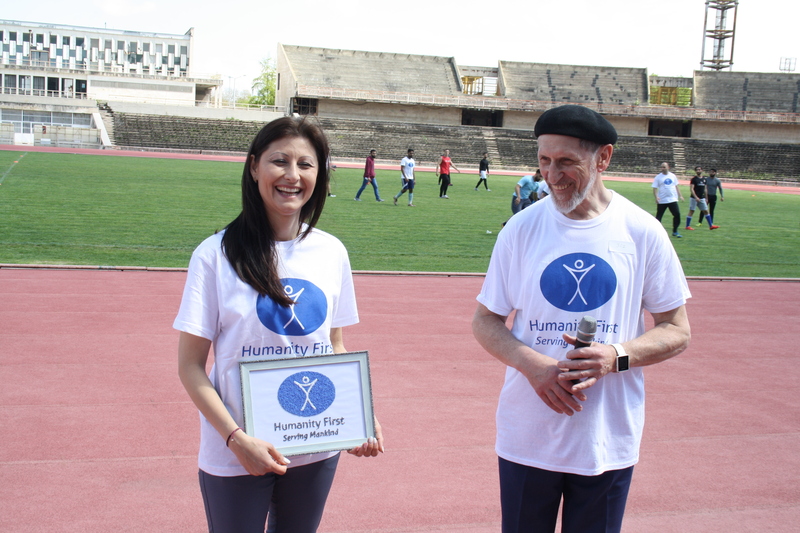 In addition to Humanity First many other humanitarian organisations including Red Cross also sponsored the event. Almost half a dozen stalls were erected to house the activities of different organisation. The whole program went extremely well and all were happy to be part of it. Children with special needs were very happy to have received the needy equipment and one could see the tears of joy and gratitude in their eyes. 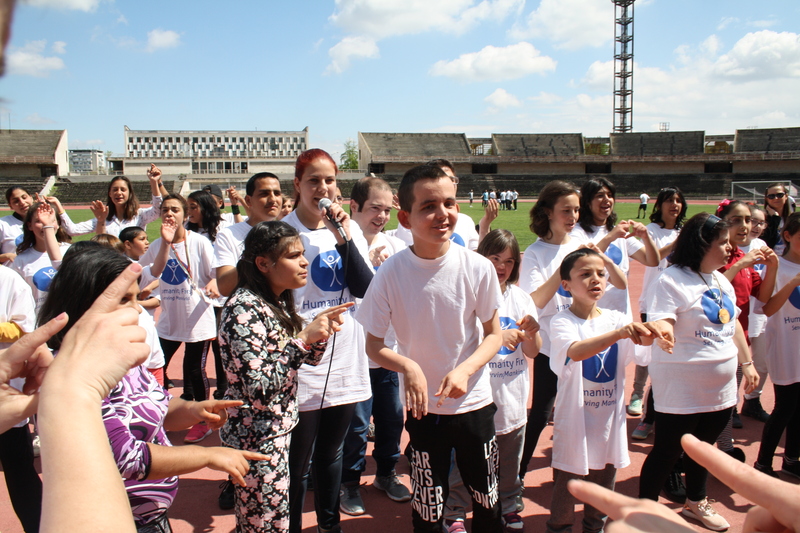 It was an historical and first ever such event in Bulgaria by Humanity First. Local Officials presented appreciation and recognition certificates to Humanity First and hoped such cooperation will continue in future. 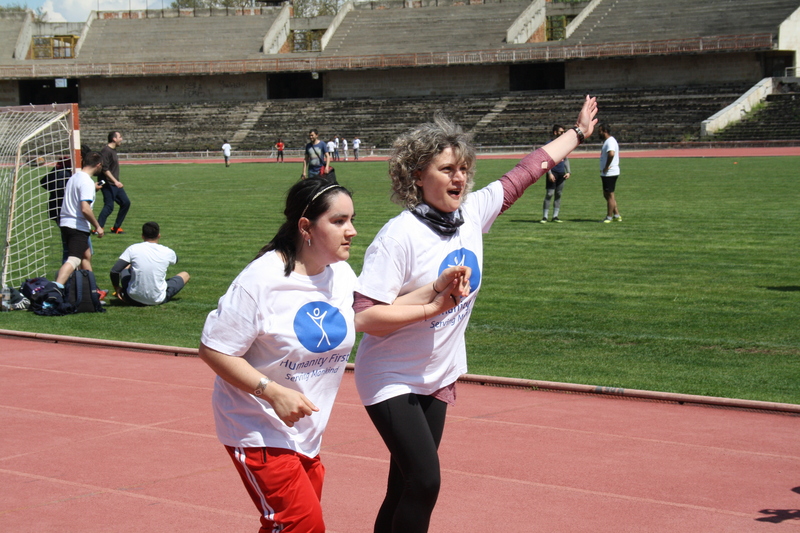 A child with special needs being encouraged to complete the CW. Was a great event and really a pleasure to be part of it.